Before now, Arvixe hosting has been the talk of the blogosphere; and i do remember almost every blogger would have loved to have a piece of their awesome but now terrible hosting services ( I can attest to the shared hosting plan). This article is not written to sabotage the image of Arvixe.com but has been culled up based on true life experience and how further issues that falls within this space will be combated before it escalates to the next level. I still hold arvixe in high esteem but if i can't tell them how they treated me , I may be left with no other option than burying the hatchet and allow their competitors rip them off their hosting service. I have been using Arvixe shared hosting plan for like a year and 2 months or so, but have had few re-occuring issues with them, which i felt the customer care or the technical team will proffer resolution to in no distant time but to no avail. I continued using there service, exercising more patient as they have always asked me to do but the issues seems not to be having the adequate attention needed for it to reach an amicable resolution. I never wanted to put them to a rush, since i had still taken them for their word. I remember complaining to arvixe regarding having some errors in my cpanel and the instability of my website which makes it goes offline at times. I reported the case via their forum, an email, and the support centre but got the assurance that all will be well. I knew all was not well when the hosting service was becoming more problematic as the sun sets on daily basis. I continued patronizing them and renewed my hosting service with them for another year and the next two months of 2014 was a deadly combat between myself and the hosting company. On the 26th of October, 2014 was when Arvixe gave me the blow of life. By then, i had traveled to Port Harcourt city for an examination in school. I went along with my laptop and my modem so i could continue publication of my articles to keep my readers glued to the latest trends on my blog. By the way, the month of October, i had four thousand extra visits on daily basis which led to an increment in traffic and to other areas. Happily i embarked on my journey to PH city and when i finally arrived, i had my laptop switched on to check the progress so far and this was when i noticed that my site has been offline the whole day. I was like "WTF," are these guys for real"? i asked myself." Without wasting time, i posted the complaint in their forum, their live chat and at their support centre so my issue will be attended to with urgency. Yes! they did responded after an hour or so and reassured me that they were looking into the case. I tried reaccessing my site and what i saw was "Resource limit reached." This got me worried because i was not using more CPU resources than necessary. Few minutes later, i was contacted by arvixe. i was informed i had reached the maximum CPU resource limit and i needed to upgrade. This is where the upgrade saga and the pathetic customer response to my case began. I contacted a customer care and i was told that the business class plan would be favorable for me to upgrade my site to and everything will be ok if i eventually upgrade to that plan. The plan cost about $30 dollars per month which a free trial can be tried out before fully purchasing the plan. So i asked arvixe to upgrade my plan to the business class which they did and by then my site was still drowning offline. I thought this was going to solve the issue but nothing happened. I contacted the team again and told them how my site was repeatedly going offline and this was bad for my traffic.Minutes later, i received a message from the arvixe team, telling me they just discovered that my upgraded plan (Business class), was still not favorable for my site since they claim that my site was consuming more CPU resources than required. Again, the customer care contacted me to upgrade my current plan to a VPS plan which cost about $30 dollars per month which i was told that their would be no free trial and i will have to pay before my account is upgraded. Since i was not with my credit card, i had to travel back to my main town to get my details.By then the issue had given rise to four days downtime. This was really troubling my traffic as i have lost like four thousand of my daily visits. I knew i had to be quick to making the payment so they would initiate the transfer immediately. After much struggle, i made the payment of $30 dollars into their account for my VPS plan to be set up and have my current business plan upgraded to the VPS plan. The next day, i received the notification from arvixe that my plan was ready and everything was set. Feeling so excited, i checked but only to discover that my blog has still not been transfered to the new hosting plan. I contacted arvixe to transfer my blog to the hosting plan they had suggested i upgrade my current plan to in other to be free from the "CPU limit reached" issues. In the evening of the 5th day after downtime, i received an email from them stating that they can not transfer my site to the VPS plan i was asked to purchase because it was not favourable for my site any more and it was for developers.Arvixe told me for the third time to upgrade my plan to the VPS class pro which cost about $60 dollars per month. Holy Cow! i went mad, and that was the the last moment I lost interest in their hosting service because i felt they had been playing with my emotion. I went on live chat and discussed with their rep, stating the issues, and after sometime, he replied me. He suggested i should upgrade for the third time which is inline with the previous email. I came to a conclusion that arvixe was actually turning me into an upgrade harlot and that was not good for my site because of a steady decline in traffic as a result of unavailability. So i asked arvixe to refund my money and that i was no longer interested in their plan anymore. About an hour later, i received an email from the sales team informing me that my money was going to be refunded asap. 24 hours later, another email came in titled "Account refunded." Under the email, i was told that the refund may take up to two days to reflect in my account. Today is the fifth day and i am yet to receive any alert or an increase in account balance from arvixe. Finally, i have decided to move my hosting package to another hosting and i am seriously praying i should not be frustrated like arvixe had done to me. Now my question is "Has my money gone into voice mail"? and why has arvixe decided to use my business as a playground for upgrade"? and finally, what happened to their former standard of service"? these questions have continued to engage my emotion and i wish that arvixe would just return my money as soon as possible because the whole situation really made me spent more than i bargained for. Over to you, what has been your experience with your hosting service? Seems Like the jeopardy of arrivx in disappointing bloggers in the blogosphere is plethora, because have gotten many complains about them. Recently, I got a complain about them from a friend of mine, Mr Techez if you may know him. The damage they have caused me is so big. They have really punished me and now my domain has been packed and injected with advert. So annoying. I learnt about Nosa's experience too. Quite pitiful they don't value my business as much as i do value theirs. I am sorry that you had issues with our service. There are some points I would like to touch on through. That user name you provided had only been created in the last month. While you may have had issues with performance of the server you were on a VPS which means there are no other users on it, you have complete control and all the resources are dedicated (they are not shared with anyone). Unfortunately you purchased the LITE that is sub par for what you needed. You can see the plan types here: http://www.arvixe.com/vps_virtual_private_servers_hosting and the "LITE" plan is meant mainly for people that want complete control of the server. As you can see it isn't even managed and has almost less than half the resources of the higher plans. When one of our head techs said that a more powerful plan was needed you did not listen to him. This wasn't an upgrade scam, it was something that was actually needed. As for the refund it was sent as soon as you requested it and has been completely processed on our side. If you have not received it you need to contact your credit card company or your bank as we no longer have any control over it. Your billing account is still active and you can log in and see that it has been refunded. I am sorry we could not work together. Secondly, i find the sentence "When one of our head techs said that a more powerful plan was needed you did not listen to him," very offensive. I would rather not listen when i am told to upgrade and upgrade and upgrade. Of cause you are aware i plans were suggested to me on basis that i gladly obliged to.Anyway thanks for your opinion, i am really grateful you could find time to read this though. 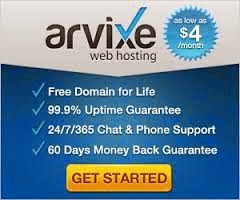 I'm really sorry that you had a bad experience with Arvixe web hosting, I've read some positive reviews about them from other blogs though I never tried them personally. Maybe you should give them a trial. You may be lucky than myself though. Yeah I too had a bad experience with them. But eventually its been solved. Wow, thats great to hear. I wish mine was resolved asap but all the same, i will host my less important sites there for the main time prior to when all the ish with server is resolved. I am also having resource usage problems on Arvixe. Have you had any problem since you switched hosts? Do you still use a share hosting plan? Not at all. I have not had any issues since a switched host. and for the second question, not at all. I was about order their hosting account and I guess I'll have to think once again. I am not discouraging you from ordering. You can as well try them out as it may work well for you. Thanks for writing such a great post! Being a Novice, I will be once and for all checking out on the web regarding posts which can be regarding assist with myself. Many thanks.